A heat shield you can scorch with a blowtorch until it glows red on one side and still comfortably touch on the other will protect a NASA probe flying to within 4 million miles of the sun’s surface. 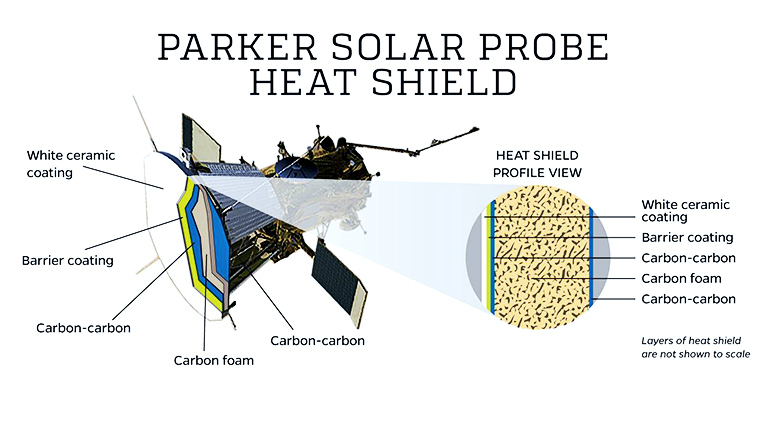 The shield is the culmination of years of work by engineers to solve what they call the “thermal problem” of the soon-to-launch Parker Solar Probe. “Thermal problem” is a shorthand way of referring to the extraordinary complications of a record-breaking dive directly into our star’s outer atmosphere, or corona. 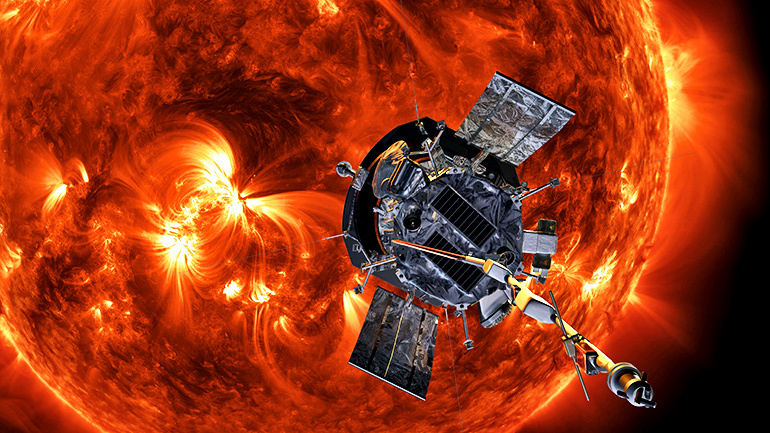 While the probe orbits the sun and records data with onboard instruments, its thermal protection system will shield the spacecraft from heat more intense than any spacecraft has ever experienced. Combined with a water-powered cooling system, the TPS will keep the majority of the probe’s instruments at about 85 degrees Fahrenheit—the equivalent of a nice summer day—while the TPS itself endures a temperature of 2,500 degrees Fahrenheit. Without the TPS, there’s no probe. The Parker Solar Probe is expected to launch from Kennedy Space Center in Cape Canaveral, Florida, in August—its launch window opens Saturday, August 11, and runs through August 23. Engineers have spent more than a decade creating the heat shield to deflect the worst of the sun’s energy. During its seven-year mission, the probe will explore some of the sun’s greatest mysteries: Why is the solar wind a breeze closer to the sun but a supersonic torrent farther away? Why is the corona itself millions of degrees hotter than the surface? What are the mechanisms behind the astoundingly fast-moving solar energetic particles that can interfere with spacecraft, disrupt communications on Earth, and endanger astronauts? Engineers have spent more than a decade creating the heat shield to deflect the worst of the sun’s energy. The front and back faces are made of sheets of carbon-carbon, a lightweight material with superior mechanical properties especially suited for high temperatures. At less than a tenth of an inch, the two carbon-carbon sheets are thin enough to bend. Between them is about 4.5 inches of carbon foam, typically used in medicine for bone replacement. This sandwich design stiffens everything up—like corrugated cardboard—while allowing the 8-foot heat shield to weigh in at only about 160 pounds. Carbon itself conducts heat, but carbon foam is 97 percent air. There’s just not that much material for heat to travel through. The heat shield will be 2500 degrees Fahrenheit on the side facing the sun, but only 600 degrees Fahrenheit at the back. Even the carbon foam’s impressive heat-dispersing properties weren’t enough to keep the spacecraft at its required temperature, though. Because there’s no air in space to provide cooling, the only way for material to expel heat is to scatter light and eject heat in the form of photons. For that, another layer of protection was necessary: a white coating that would reflect heat and light. After extensive testing, the team settled on a coating based on bright white aluminum oxide. That coating could react in high temperatures, however, with the carbon of the heat shield and turn gray, so the engineers added a layer of tungsten, thinner than a strand of hair, between the heat shield and the coating to stop the two from interacting. They added nanoscale dopants to make the coating whiter and to inhibit the expansion of aluminum oxide grains when exposed to heat. “The whole thing was struggling to find a ceramic coating that both reflects light and emits the heat,” says Dennis Nagle, principal research engineer at the Center for Systems Science and Engineering. Typically, when working with enamel, Nagle says, a hard, nonporous coating is preferred—one that’ll crack when hit with a hammer. But under the temperatures the Parker Solar Probe will face, a smooth coating would shatter like a window hit with a rock. Instead the goal was a uniformly porous coating that would withstand extreme environments. When cracks start in a porous coating, they’ll stop when they hit a pore. Several rough, grainy layers make up the coating—enough that one set of ceramic grains would reflect light that another layer misses. After the probe launches, it will fly repeatedly past Venus, gradually coming closer and closer to the sun, far closer even than Mercury, the innermost planet, which at its closest is still more than 28 million miles out. At closest approach, the spacecraft will be travelling around the sun at about 430,000 mph.